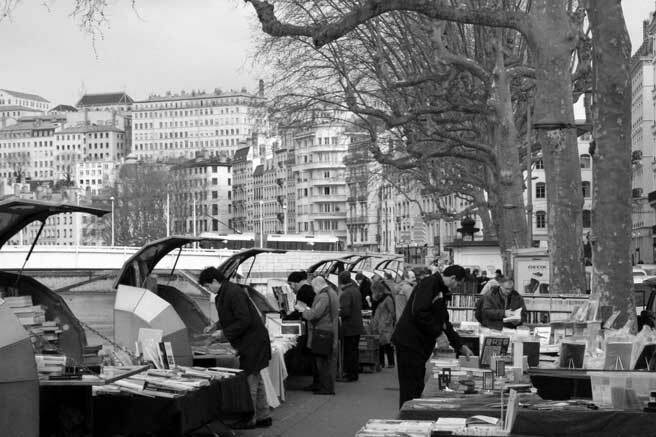 Lyon gets a wave of mystery and crime writers every Spring. Lyon's international crime writers' conference is in full swing and I look around fantasizing about what might be going through the minds of all these clean cut men dressed in black, the ones carrying satchels and strolling through the alleys and stairwells about town. I always let my imagination run wild. Who knows who they really are? Have they always been here? Lyon takes on an altogether more mysterious sheen and I relish every moment. I met with a fascinating author, William Bayer, and we had lunch together. I am reading his work in French since the English version of his books are not readily available here. Apparently it always rains during the Quais du Polar in Lyon, and this year was no exception, but I think it was meant to be that way. We enjoyed an afternoon walk nonetheless. The booksellers are doing brisk business, since it really is time to venture out and try harder to bask in the relative warmth mother nature is mustering up at the moment. Now is the time to celebrate a mystery on a café terrace. 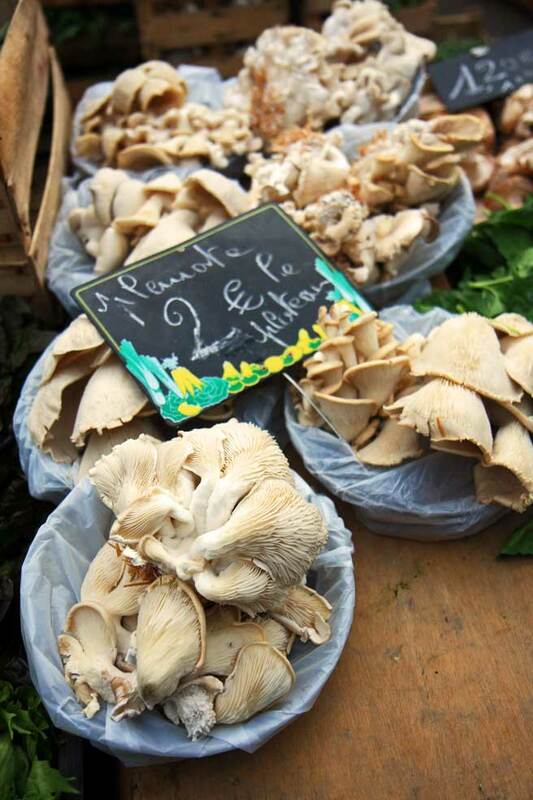 This weekend, on the quai St. Antoine, we see that the oyster mushrooms are flourishing, as well as the coldhouse radishes. These hearty reminders of the sweet tender beauty to come ring like church bells on a chilly morning. Turnip purée served alongside roasted duck. 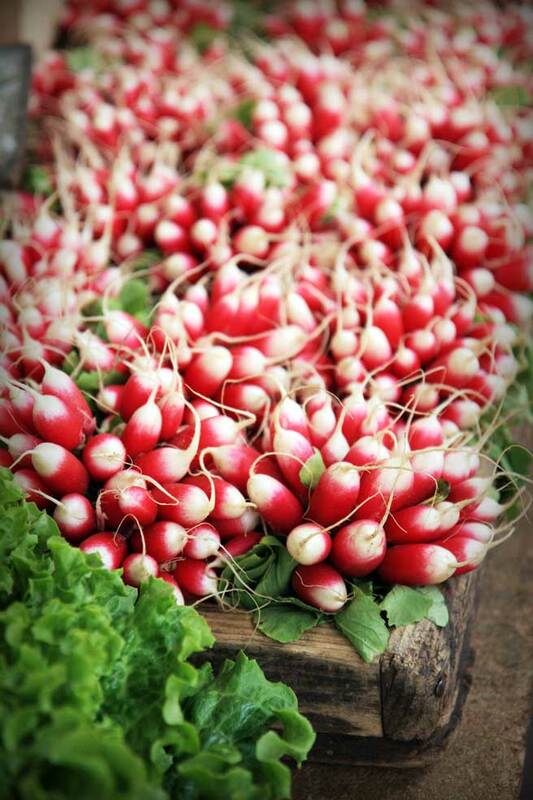 A cocotte of langoustine simmered with radishes and turnips might be good right now, considering the radishes. A sirloin steak served with glazed turnips. Pepper seasoned steak (mignonette) with young turnips and anchovies. A golden baked turnip cake to serve with meats. Spit roasted pigeon served with turnip "saurkraut", its legs stuffed with dates and chorizo. Pressed foie gras terrine served with caramelized turnips. Charcuterie served over baked shredded turnips. Beef sirloin served with tender slow cooked orange-seasoned turnips. Pan seared foie gras with cabbage root and turnip caramel. 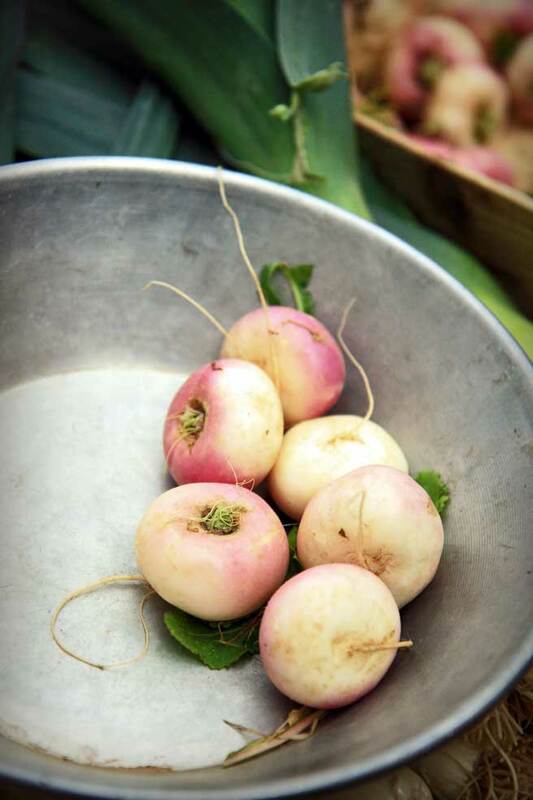 Why not keep your eye out for the late winter turnips? This time of year it's easy to ignore them, but the winter varieties are very good. What wonderful tips and beautiful photos~the mushrooms are very enticing.....oh to bite into some of those sweet radishes! I'm a big fan of the leaves as well as the root. Esp a gratin of blanched leaves served with a hunk of poached gamon or veal shank. Braised in olive oil with lot's of garlic, tomatoes and chickpeas or with pasta- blanched leaves tossed and heated through some dry chilli, crushed garlic and olive oil. That Lyon light...you've captured beautifully. Hello Jann & Dillon. Thanks for the great tips about the greens, Dillon. I will certainly keep this in mind. A friend of ours directed us to your blog the other day after hearing about it on the radio in Switzerland and we wish we had found it sooner! My wife and I are both from the US and we have been living in the 6eme in Lyon since last August. Sadly, we will be leaving in the end of June, but we would love to contact you to learn more about Lyon's greatest secrets for gourmands like us! Doug! Bummer that you're leaving so soon - but guess what? You have SPRING yet to discover! Make sure you do contact me! I adore your blog. Every time I visit, I feel completely at home. It brings me joy to see the world through your eyes. The turnips look amazing! I love the idea of glazing them and serving with the sirloin. That's so funny about the crime writers in Lyon. Cheers! What a beautiful blog you have and so "tasty" too! This is my first visit. I don't have time to linger but I will be back in a few days. William Bayer is also the husband of Paula Wolfert. In fact, my introduction to him was through Paula Wolfert, who let me know he was coming to town. He has won many awards here in France for his writing, and had quite a following at the conference. Not to mention that he is a great conversationalist. I had a great time. Japanese turnips are due in soon at USGM. While I usually don't cook meat much at home, some of these ideas have started some wheels turning.